Bitter foods do not appeal to many people, but the bitter gourd is a common food in Indian cuisine. This vegetable, also known as bitter melon or balsam pear, offers a variety of benefits, both nutritional and medicinal. Bitter gourd is a good source of several vitamins and good for a low calorie diet. However, consult your physician before eating this vegetable as a treatment for any medical condition. Bitter gourd is a good choice for restricted calorie diets – a 1-cup serving of this vegetable adds only 24 calories to your meal plan. As this gourd is an acquired taste, you may not enjoy it just by itself. You can add it to soups and casseroles, but your total caloric intake would be greater. Bitter gourd is quite low in fat as well, containing 0.2 g per serving. A serving of bitter gourd satisfies your entire daily need of vitamin K. The vitamin K available in this bitter vegetable decreases your risk of excessive bleeding and contributes to the integrity of your bones. Taking antibiotics may leach vitamin K from your body, so eating foods like bitter gourd is a good choice to boost your intake. Incorporating a bitter gourd into your diet increases your intake of vitamin C. One serving of this bumpy-skinned vegetable contains 54 percent of the daily recommended intake of vitamin C, which makes it a good option for blood vessel health due to its impact on collagen production. You need this vitamin to repair injuries, including bone breaks and skin lacerations. This antioxidant vitamin contributes to protection against free radical damage that may trigger some types of cancer and other conditions. One serving of bitter gourd provides 28 percent of the vitamin A your body requires each day. You need the vitamin A in this vegetable to keep your mucus membranes and other soft tissues healthy, and it also has other benefits for your eyes. This vitamin helps prevent night blindness and cataracts. A study published in the April 2011 issue of the "Cochrane Database of Systematic Reviews" correlates a vitamin A deficiency with blindness triggered by measles, so consider adding bitter gourd to your diet if you have this disease to avoid eye problems. Evidence in the March 2008 edition of the journal "Chemistry & Biology" indicates that properties of the bitter gourd may offer a natural treatment option for people with type-2 diabetes. 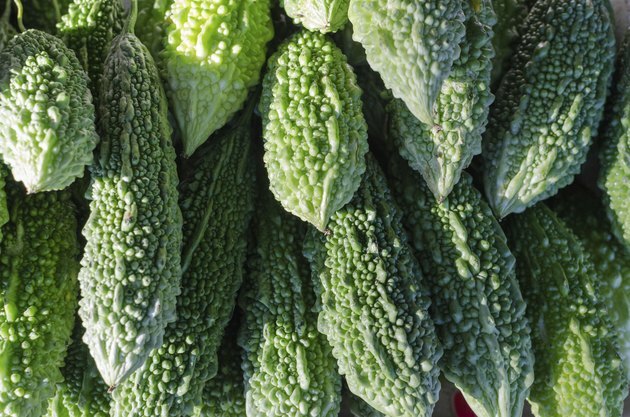 Certain compounds isolated in this vegetable activate an enzyme known as AMPK, which helps to regulate glucose metabolism. This action helps diabetics, who have trouble converting glucose to energy, use the insulin they produce more effectively.